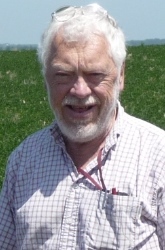 By James E. Specht, Ph.D.
Summary: This presentation will help growers, consultants, and research better understand the agronomic tools at hand for managing soybean water stress. In each growing season, USA soybean crops invariably experience water stress of significant degree and duration that will reduce seed yield below what’s attainable in a totally non-water-stressed production environment. Aside from irrigation, which is not an option for most U.S. soybean producers, only two other practices can be used to minimize the impact of growing season rainfall deficits. The first is to use no-till to retain prior crop residue on the soil surface after its harvest, because no-till captures and stores (in the soil) more of the off-season snowmelt and rainfall before soybeans are planted. The residue-covered soil surface also results in less water evaporation from exposed soil surfaces after planting until crop canopies and takes over that job. The second is to plant the soybean crop as early as possible so that (1) the crop can use more of the early solar radiation that is not available to a later-planted crop, (2) the crop can use more of the early spring rainfall for growth that is not available to a later planting dates, 3) the crop can canopy sooner in the growing season for capturing all of the incoming solar radiation and reducing soil water evaporation.